Bio-Bizz All-Mix is unlike anything you would find in a garden centre. It contains an effective blend of soil (20%), compost (35%), worm castings (10%) and Perlite (30%) as well as a special 'pre-mix' (5%) of biologically active organic ingredients that have been fermented for a month to create a potent mixture. 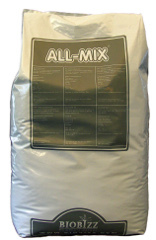 All Mix is suitable for all stages of plant life and can be purchased in two different sized bags; 20 Litres and 50 Litres. Bio-Bizz All-Mix is 100% organic. Due to the weight and bulk of this product, we must regrettably add a shipping surcharge, which is included in the price. Massive Â£200 saving on pallet quantities!